"1. Having no reference to material objects or specific examples. Not concrete. 2. Not applied or practical; theoretical. 3. Hard to understand; recondite (requiring special knowledge to be understood. Abstruse (not easy to understand, esoteric). 4. Fine Art. Characterised by geometric, formalised or nonrepresentational qualities. 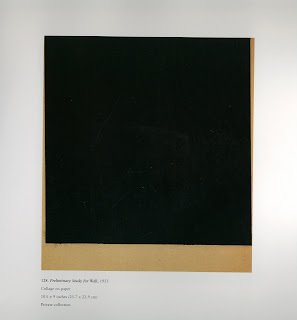 The following by Kenneth Martin (1951) demonstrates the difficulties of definition that varieties of non-representational art created for the practitioner-theorists of 'abstraction'. "What is generally termed 'abstract' is not to be confused with the abstraction from nature which is concerned with the visual aspect of nature and its reduction to a pictorial form, for, although abstract art has developed through this, it has become a construction coming from within. ... Just as an idea can be given form, so can form be given meaning. By taking the severest form and developing it according to s strict rule, the painter can fill it with significance within the limitations imposed. Such limitations have been constantly used in poetry and music ... The square, the circle, the triangle etc.m are primary elements in the vocabulary of forms, not ends in themselves ... 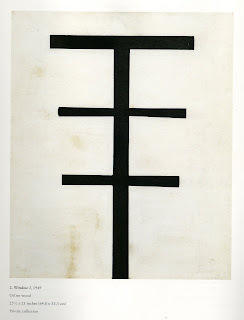 The painter attempts to create a universal language as against a private language ... Heroic efforts have been made towards the creation of this language". 'Terry Frost Six Decades'. RCA p.17. 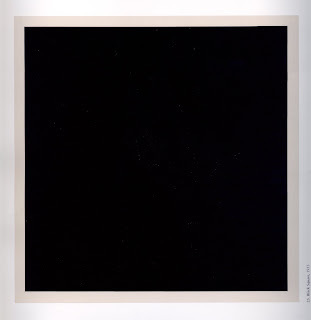 I have been interested in Ellsworth Kelly's work for some time, feeling the simplicity of his flat plains of colour, his black and white. His inspiration often comes from fleeting visions through doorways, windows or shadows falling across structures. His paintings have an extraordinary poetic vision and sense of geometric clarity. He experimented at one time with working clinically to the rules of the Golden Section but he found that his work conformed to perfect balance when working intuitively. Waldman Diane, Ed. 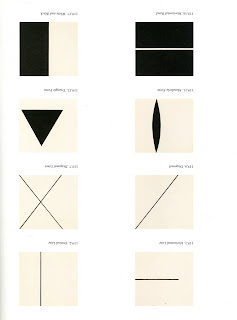 Ellsworth Kelly: a Retrospective. Guggenheim Museum. 'Rooftops with blue squares'. (Silk Scarf, Carol Mackenzie Gale). The simple geometry rigid in a painting, changes with the fluidity of silk when draped. "Preliminary study for Wall", 1955. I love this example of perfect space, asymmetric in balance and am working with black and coffee with my lorry studies. Kelly thought Mondrian's art was spiritual, feeling that his approach would suit him too and he sought to achieve his own version of it. 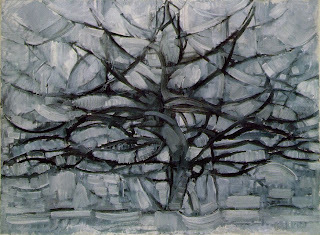 A version of Mondrian's Tree. - a spiritual journey. One of his most exciting pieces. is his book, 'Line, Form and Colour', sent to the Guggenheim Foundation. 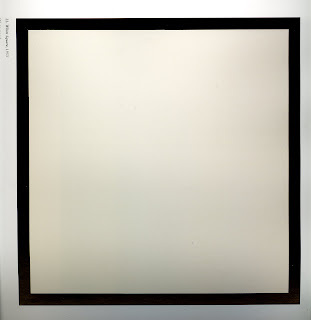 It contained 46 drawings, eahc 7 1/2 x 8 inches (later 40) with "no writing whatsoever - just (linoleum) prints".1951. 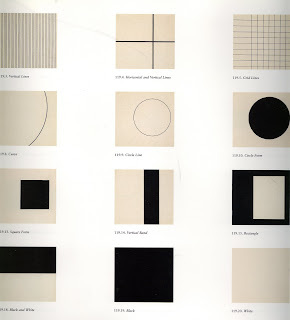 '"Line, Form and Colour", monotone pages of his book of prints which were to become the catalyst for his works of the 1950's and 1960's with new directions in abstract art. This was also the inspiration for my manifesto. I come back to the language of simple geometry. Kelly's skill in working with form, colour space and edge, create potent visual statements and as with Terry Frost's work, colour becomes the form, the flat plane, the message. PHOTOSHOP VERSUS ILLUSTRATOR AND BACK AGAIN.